I have always told my students that there are way better ways to spend $65 than getting a "concealed carry badge." I was at the gun show this weekend. One table had dozens and dozens of Hi-Points. At $225 or so, they left enough money to spend$89-$129 on the carry badges conveniently located at the same table. I was at the gun show this weekend. One table had dozens and dozens of Hi-Points. At $225 or so, they left enough money to spend $89-$129 on the carry badges conveniently located at the same table. So you bought how many....? Ooh, sorry. I meant focused pictures to follow. We were trying to be discreet. Wow! A concealed weapons permit for anywhere in The United States of America! Nice. That would be worth $129. You can get 'em for far less, online. Here's one for $32. Would I waste the money? Hell, no. Hold on, you're telling me that the morons were selling them for $129????!!?!?! Isn't Metro Pawn like $40, or something along those lines? Was Dewey with the firm Beatem, Batem, Hosem & Flee Ltd. ? I would like to have a mod split this post off so we can debate the merits of the $40 badges verses those for $129. There must be some magic in those for $129, right? Maybe they are shinyer? Maybe they are "official" of something. You naysayers could be wrong. So, just get off Andrew's back. 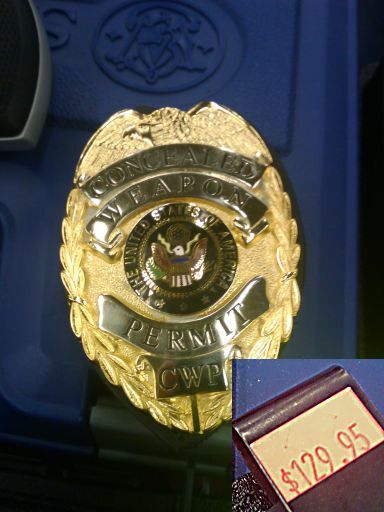 If he wants to by a CCW badge for $129, he can. I'd have asked the dealer where their lucky crack pipe was. Speaking of lucky crack pipes. Check out this new flick coming out in December. Re-make of Harvey Keitel in "Bad Lieutenant" - Anyone remember that one? And, be sure to watch out for the "breakdancing soul"
Nope. Dewey was with Cheatham and Howe. I'm nervous. Bad Lieutenant is an awesome movie, and the remake is going to have to work hard to come close..
Nicolas Cage can pull it off if anyone can, though. Although this badge topic -- and in particular this particular dealer of them -- has been talked about many times before, I'll add again that this is the same guy that I overheard telling some newbie gun buyer that the hi-point 9mm handgun he was inspecting was the type of quality gun that fathers hand down to sons, and so on and so forth, from generation to generation.